Red Velvet Brownies for a When Harry Met Sally Picnic | Good. Food. Stories. 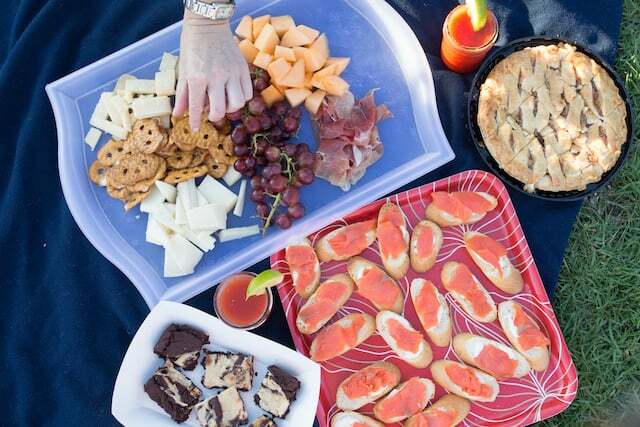 When planning a picnic menu for a big group, form follows function. Sure, you can push the envelope and serve soup in mason jars or load a cooler with homemade pots de crème, but when you’ve got 10 friends stretched over a flotilla of blankets, even a crazy party planner like myself must acknowledge the futility of trying to make an all-homemade, perfect presentation and bow down to the necessities of finger foods and bags of chips. Because I was flying across the country and didn’t have access to my own kitchen or equipment, and because our LA sightseeing (and eating) schedule was already jam-packed, I forewent homemade dishes. 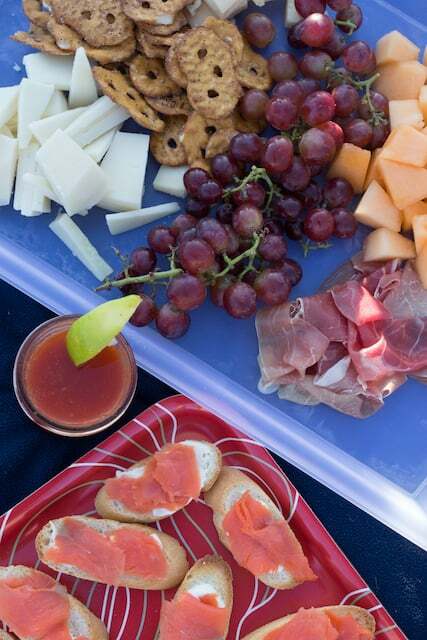 It’s a good strategy even if you do have a kitchen but are pressed for time or ability when pulling together a picnic party. Instead, I created a menu inspired by some of our favorite lines and scenes in When Harry Met Sally. Since every member of our group could recite the movie by heart and would be quoting it—loudly and gleefully—throughout the screening anyway, why not pepper the party with a few more in-jokes? 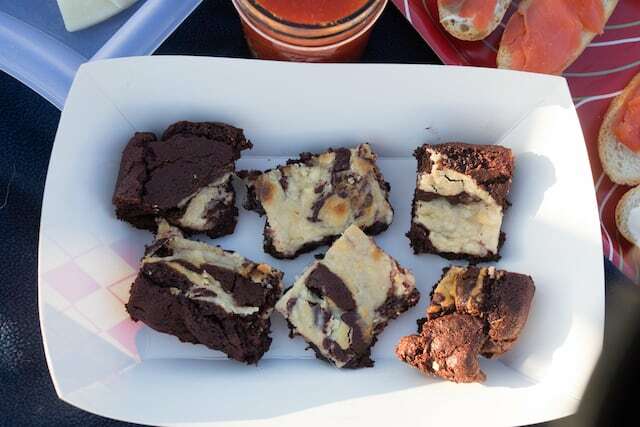 Brownies and bar cookies are perfect make-ahead options for outdoors events, since they can be cooled, sliced, and transported all in the container you baked them in. The recipe follows below: these gooey, fudgy brownies disappear quickly at any gathering I bring them to. You could even bring them on your Nora Ephron movie walking tour of New York, if you were so inclined. And yes, you could also make a pesto quiche of the Eighties, small Coney Island hot dogs (get it? ), pastrami sandwiches, or even get ambitious and do peppery paprikash in mason jars or bowls. When Harry Met Sally is a feast in so, so many ways. Note: I am not a huge fan of red food coloring, so my recipe calls for what I think is the minimal amount you can add and still note a red tinge to the brownies. If you don’t have those hang-ups, go ahead and add more, or if you’d prefer to leave the food coloring out altogether, go ahead. The brownies will have a slight ruddy tint, thanks to the natural chemical reaction of vinegar, baking soda, and cocoa powder, but they’ll look more like regular brownies. Preheat the oven to 350 degrees F. Line a square baking pan with parchment paper, leaving enough to overhang each side of the pan. In a medium bowl, beat the cream cheese, sugar, and vanilla together with an electric hand mixer on low speed until combined. Set aside. Whisk the flour, baking soda, and salt together in a small bowl. Set aside. Melt the butter, then pour into a large bowl. Gently stir the cocoa powder into the butter until combined, then stir in the sugar, followed by the eggs, one at a time, and finally the vinegar and food coloring (if using). Gently fold in the flour mixture just until combined and no large pockets of dry flour remain. Scrape the brownie base into the pan and spread it to the corners. Dollop the cream cheese mixture over the brownie base. 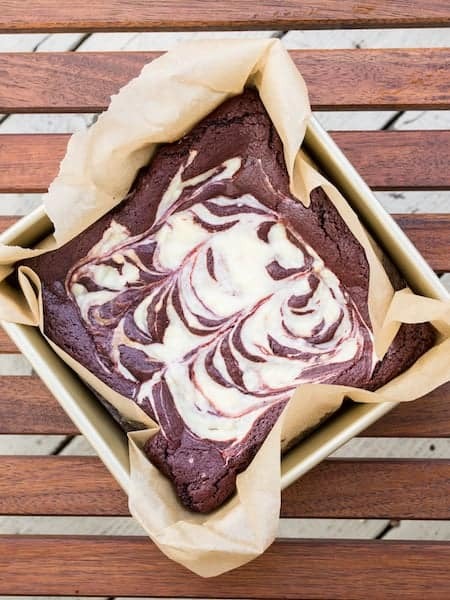 Pull a knife through the cream cheese and brownie base to create a swirl effect. Bake for 28-30 minutes, just until the brownies are set and barely jiggly, and when a knife inserted into the center of the brownies comes out clean. Cool the brownies in the pan on a wire rack for at least 1 hour or until the bottom of the pan is no longer warm to the touch. Use the parchment paper to lift the brownies out of the pan and cut the brownies into 16 squares. Eat immediately, or store leftover brownies at room temperature in a sealed container for up to 5 days.